Too often, I find myself trapped in that writerly stereotype that finds me sitting and typing with periodic breaks to sit somewhere else and try to figure out what to go back and type. For excitement, I may try to accomplish some chores. The plain fact is that you have to get out if you want to have any fuel to keep the fire burning. So, I had the privilege of hearing Catharine Opie speak the other night. I really had no idea what to expect because the lecture related to a showing of her exhibit, 700 Nimes Road. If you know the artist or her work, then you are probably sitting there going, for shame, Craig- everyone knows this photographer. She is a renowned provocateur who taught at Yale and shown at the Guggenheim and the Whitney and is one of the great lights of modern art. She is famous for her photos of the LGBTQ community and respected for her activism. Her work was recently used on Transparent. In my defense, I don’t know what I knew already or when I knew it. 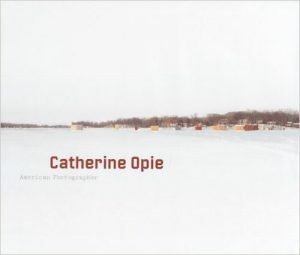 If Catharine Opie is unfamiliar to you, then do some web surfing and maybe visit her work if you can. which has often challenged the status quo. At times, her self-portraits have gone even further by forcing us to confront deep-set feelings. Once you see those, then the wide, wide range of work produced by Opie may surprise you. Notoriety can create blinders. Opie has worked as a documentary photographer. She has done landscapes of Minnesota ice houses and high school football fields. She has found ways to bring together abstracts, landscapes, and portraits. Her work often references classic works of fine art and photography. In short, she contains multitudes. I write, but I bore easily (or we could be polite and say that I have wide-ranging interests). It is inspirational to find an artist who uses their accumulated skills and talent to explore so many genres within their chosen field. More than that, art is work. If we are fortunate, art is work over a long lifetime of struggling with a chosen medium. Looking under the hood and seeing all the work that a lifetime has geberated is a privilege and a thrill. Stephen King and Andy Warhol are not aberrations. They are working artists who lived long enough and worked every day. The lesson is unrelenting and powerful. You’ve Got to Check This Out is a blog series about music, words, and all sorts of artistic matters. It started with an explanation. 210 more to go.